A pharmacy technician assists a pharmacist with the preparation of prescription medications for customers. He or she may receive written prescription requests or may process requests doctors' offices that have been sent electronically or phoned in. Depending on state laws, a pharmacy technician may compound or mix medications and get refill authorizations from doctors. Technicians organize drug inventory and lets the pharmacist know if there are any shortages. A pharmacy technician is not the same as a pharmacy aide, although pharmacy technicians and pharmacy aides (also called pharmacy assistants) both assist and are both supervised by pharmacists. Although there is an overlap between their duties, an aide performs primarily clerical tasks while a tech helps the pharmacist fill prescriptions. Fill bottles with doctor-prescribed medications, type and apply labels with directions and other information for patients, and pre-pack bulk medications. A pharmacy technician's salary varies based on the area of expertise, level of experience, education, certifications, and other factors such as geographic location. There are no formal training requirements for pharmacy technicians, but getting the right training can make a job candidate more appealing to employers. Education: Pharmacy technicians typically need a high school diploma or equivalent. Many pharmacy technicians receive only on-the-job training, although many employers prefer to hire applicants who have attended a formal training program. Training: Much of the training takes place while performing the job, and each employer may have different subject matter and training procedures. On-the-job training may last from three months to a year. Vocational school: While not required, individuals can complete a certificate or associate degree program covering topics such as math used in pharmacies, ways of dispensing medication, pharmacy law, record keeping, and other relevant topics. Formal pharmacy technician programs are available in community colleges, vocational schools, hospitals, or the military and run for six months to two years. Clinical experience: Pharmacy technicians can gain clinical experience as part of a vocational program, where they get hands-on training. Regulation: Most states regulate pharmacy technicians in some way, which may include an exam, formal training or education, fees, a criminal background check, and continuing education. In most states, pharmacy technicians must register with that state's board of pharmacy. Several professional organizations offer certification which is mandatory only in some states. Like formal training, it may make a job candidate more appealing to employers. Active listening: Pharmacy technicians must be able to understand doctors' instructions and customers' requests and inquiries. Speaking: They need the ability to convey information to pharmacists and comfortably communicate with doctors and customers. Attention to detail: It is essential to be careful when filling prescriptions and preparing labels. Mistakes can be deadly. Organizational skills: Being well organized also helps pharmacy technicians avoid dangerous errors. Reading comprehension: The ability to understand written documentation is crucial. 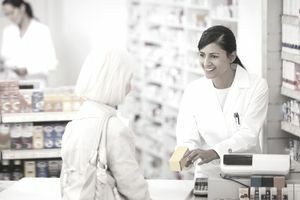 According to the U.S. Bureau of Labor Statistics, the outlook for pharmacy technicians over the next decade relative to other occupations and industries is faster than average, driven by several different factors that contribute to an increase in the demand for prescribed medication, including an aging population and the increased incidence of certain chronic diseases such as diabetes. Advances in medical research will also result in additional, new prescription medications being developed and used in treatment programs. Employment is expected to grow by about 12% over the next 10 years, which is faster growth than the average for all occupations between 2016 and 2026. Growth for other health technologists and technicians is projected to grow even faster, at 14% over the next 10 years. These growth rates compare to the projected 7% growth for all occupations. Editors who have learned to adapt to online media work and work comfortably with using digital and electronic tools will find they have an advantage when searching for jobs. More than half of all pharmacy technician jobs are in pharmacies and drug stores. The remaining jobs take place in hospitals and general merchandise stores. Positions are usually full-time, and since many pharmacies stay open all hours, schedules may include weekends and evenings. Look for job openings at resources like the Pharmacy Technician Certification Board's (PTCB) online career center, job listings on individual pharmacy and drug store company websites, or check more general job-search sites like Indeed.com, Monster.com, and Glassdoor.com for the latest job postings. Look for volunteer opportunities with local pharmacies and any school or certification program you're attending. Get guidance and expand your skills by shadowing an experienced pharmacy technician or pharmacist. You can find pharmacy technician internships through online job search sites and occupational therapy school career centers.